Chinese manufacturing giants outperformed big service companies in 2017 according to a report released Sunday by the China Enterprise Confederation (CEC) during the 2018 China Top 500 Enterprises Summit in Xi'an, capital of northern China's Shaanxi province. Altogether, 253 manufacturing enterprises were listed in the 2018 Top 500 Chinese Enterprises which was compiled based on statistics from 2017. 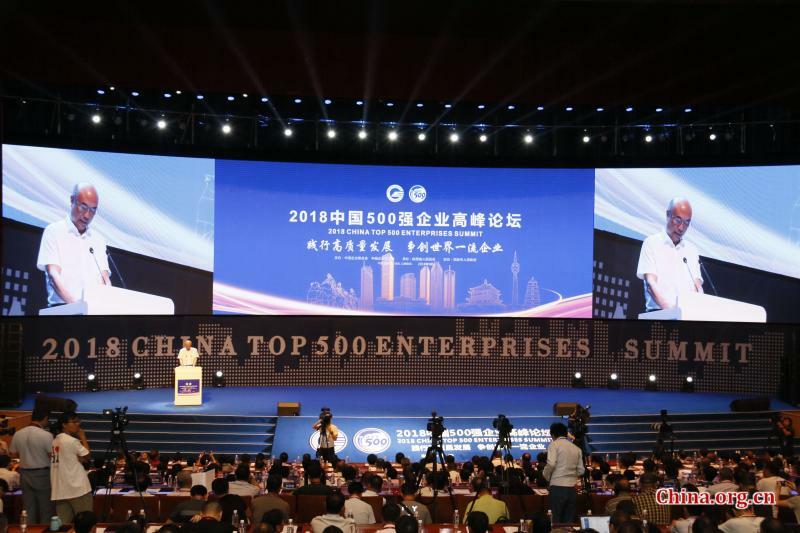 The figure is eight more than that of the previous year, according to the Report on the Development of 2018 China Top 500 Enterprises issued by the CEC. The revenue of the 2018 Top 500 Chinese Manufacturing Enterprises increased 2.93 percent more than that of the Top 500 Chinese Service Enterprises, while in the previous five years, service enterprises had the lead. The net profit growth rate of the 2018 Top 500 Chinese Manufacturing Enterprises was 7.1 percent higher than that of the Top 500 Chinese Service Enterprises, which means that manufacturing giants improved their ability to make profits compared with big service companies. Some 484 enterprises among the list of the 2018 Top 500 Chinese Manufacturing Enterprises provided complete research-and-development (R&D) spending statistics to the CEC. These 484 enterprises invested about 654.6 billion yuan (about US$96 billion) on R&D, a 19.3 percent increase from the previous year. The heavy and chemical industry still plays an important role in the list of the 2018 Top 500 Chinese Manufacturing Enterprises. The first 10 companies on the list all belong to the heavy and chemical sector except HUAWEI. Ferrous metallurgical companies accounted for 76 positions in the 2018 Top 500 Chinese Manufacturing Enterprises. The top two industries that had the highest income and profits were ferrous metallurgy and automotive and parts manufacturing. Chinese manufacturing giants outperformed big service companies in 2017 according to a report released Sunday by the China Enterprise Confederation (CEC).